Help is a powerful four-letter word and for many of the people we support, it is a word that comes shortly after a sobering realization that something must change just as it did for Monarch Peer Support Specialist, Darryl LaFace in 2013. LaFace grew up outside of the United States most of his childhood and called Cuba, Philippines, Spain, Morroco, and Puerto Rico home for portions of his formative years. As an adult, LaFace earned his master’s in Counseling an​​d Psychology and later went on to establish a successful management consulting company. He traveled and worked in countries like Germany, Israel, France, Japan, and England for a while, and then lived in Minnesota, Colorado, California while in the U.S., until settling in Raleigh, North Carolina in 2000. It was in the early 2000s when he started to drink heavily. “I started to notice the drinking wasn’t taking the edge off and I could no longer relax. What started as a weekend party drug for me turned into an addiction to crystal meth. It happened fast, too – within six months to a year – I lost everything,” says LaFace. LaFace celebrated five years of sobriety on May 1, 2018, and the seventh anniversary of his second chance at life. LaFace intentionally overdosed in 2011, was arrested, and assessed at a behavioral health facility. “I knew I needed help, but I refused. My family would keep trying to convince me that I had an addiction but I initially refused help,” says LaFace. After the first arrest and suicide attempt, police kept surveillance of LaFace’s movement and activity with drugs. He was arrested again within a year and was facing an eight-year prison sentence for possession and sale of crystal meth. LaFace’s beginnings in peer support and helping others started out in seeking volunteer work after his second arrest and wanting to prove to the judge that this wasn’t the type of person he was. 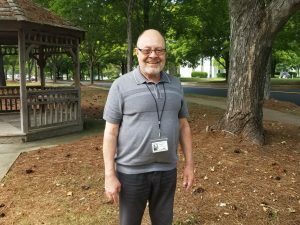 LaFace was committed to improving and wanted to show that he was an asset to his community so he began volunteering for NAMI’s Durham chapter and asked to sit on the board of Recovery Community of Durham County. He was also very actively involved in Crystal Meth Anonymous and worked with a team to help that group grow from two meetings to five meetings just in the North Carolina triangle area. “I think only one in five people addicted to crystal meth get out of that lifestyle and I recognize that I wouldn’t have been able to get here had I not had some support. I want to be that listening ear for other people trying to improve their lives,” adds LaFace. As a peer support specialist, LaFace helps nearly eight to twelve individuals in the Charlotte area navigate their own journey to recovery and combines his first-hand experience with bi-polar disorder and substance use recovery with his coaching expertise. “You can’t do anything like this by yourself. And being that other person for them even if just for a few hours a week means they have someone to listen if that’s what they need. They have someone to grab a coffee with or go for walk. It is their choice to decide what they need,” says LaFace. If you or someone you know needs mental health support, please call Monarch at (866) 272-7826, Monday through Friday, 8 a.m. – 5 p.m. For 24/7 support, call The National Suicide Prevention Lifeline at (800) 273-8255.